Everton outfoxed Arsenal with a surprise strategy and some clever movement. Roberto Martinez wasn’t able to welcome back Phil Jagielka, but John Stones has been excellent as his replacement. Ross Barkley was left out, with Leon Osman favoured – but Osman barely lasted ten minutes before getting injured, and Barkley replaced him. Arsene Wenger is without the preferred left side of his defence, as well as Mesut Ozil, Jack Wilshere and Theo Walcott. Aaron Ramsey was on the bench after three months out, alongside Alex Oxlade-Chamberlain, who had been expected to return. Everton have often won games late on this season, but here they took command in the first half and sealed the contest on the hour mark. On paper, Everton’s line-up appeared to be their usual 4-2-3-1, with Steven Naismith – a regular sub – a surprise selection, and set to play on the opposite wing to Kevin Mirallas. Leon Osman was seemingly the number ten behind Romelu Lukaku. Instead, it was a completely different system. The shape of the midfield was different, with Osman (and then Barkley) a left-sided central midfielder in a trio, with Gareth Barry as the deepest, often dropping between the centre-backs to help Everton pass out from the back. He does that in a 4-2-3-1, too, but it was more obvious in this 4-3-3. More significant, however, was the approach upfront – where Mirallas was on the left, Naismith through the middle, and Romelu Lukaku wide on the right, a completely different system from anything Everton have previously used this season. This was a brave call by Martinez in such a big game, but the approach worked perfectly. The most interesting factor of the system was Naismith as a false nine, playing closer to the Arsenal central midfielders than the centre-backs, but making excellent runs to tempt Thomas Vermaelen, in particular, out of position. He was basically the forward point of a diamond midfield. Naismith has previously only played upfront for Everton in an emergency, when Lukaku and others have been unavailable, but his movement and link-up play has always been extremely impressive, and it’s remarkable how Martinez has managed to turn a hard-working but limited player, something of jack-of-all-trades and a ‘willing runner’, into such an effective tactical weapon. Arsenal never got to grips with him, and although he opened the scoring with a cool finish, he was primarily the catalyst for Everton’s attacks with his decoy running, rather than with his direct contributions. Look how he always collected the ball in the channels, rather than between the centre-backs, despite theoretically playing in the centre of the pitch. As well as tempting the Arsenal centre-backs up the pitch, he also helped Everton retain width by darting into wide positions when Mirallas and, in particular, Lukaku came inside. 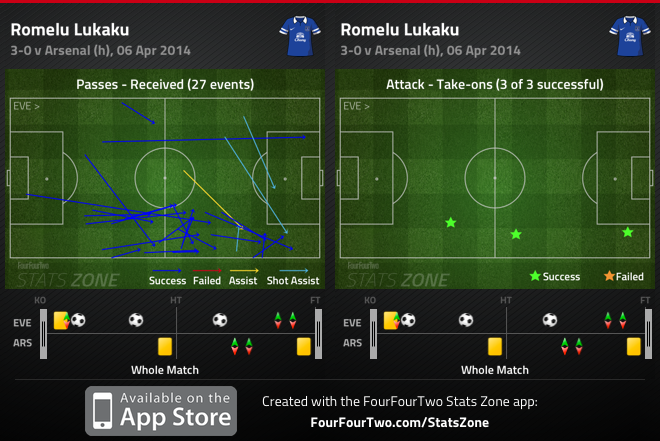 This meant, even more surprisingly, that Lukaku was deployed on the right flank. He won an aerial duel against Nacho Monreal within the first 30 seconds, and stayed extremely high up the pitch on that side, more a right-sided forward than a right-winger. His lack of defensive ability meant some of Arsenal’s best opportunities came when Monreal sporadically overlapped down that side – the left-back was caught offside at one point – but overall Everton gained more than they suffered in this position. Three of the passes that created Lukaku’s changes are very similar – quick switches from the opposite flank. To understand quite why Arsenal suffered so much from the movement upfront, it’s worth considering how they were being exposed in another area of the pitch – their right flank. There was great fluidity in this position, with Santi Cazorla starting there, but Tomas Rosicky and – at times – Lukas Podolski all covering that side. With Cazorla and Rosicky drifting inside into central positions, there was space for Leighton Baines to exploit by moving forward in possession. This meant that Bacary Sagna was forced forward to deal with the left-back, which was problematic in itself considering his primary job was to mark Mirallas (the only one of Everton’s forwards who wasn’t in an entirely surprising position, and therefore with an obvious opponent). But it also meant Arsenal were forced to cope three-on-three at the back, and Everton’s clever movement was always likely to cause them problems. This situation was obvious within the first six minutes. Baines was in possession, Sagna moved forward, and Arsenal were effectively now defending with a back three. Mirallas checked to see the situation in the centre, and made a decoy run towards the left touchline to drag Mertesacker into the right-back zone. Vermaelen was watching Lukaku behind, which meant a huge space opened up for Naismith in the inside-left channel – but he misplayed his attempted square pass to Lukaku, once Vermaelen had darted towards the Scot. This set the tone, and was a microcosm of Everton’s approach for the rest of the game. Exactly the same thing happened for Everton’s first goal: Baines on the ball and Sagna up the pitch. Mirallas running towards the touchline to drag Mertesacker away from the centre, leaving Vermaelen and Monreal two against two versus Naismith and Lukaku. This time Baines curled a fantastic pass in behind the defence for Lukaku, who had his shot saved, and Naismith converted the rebound. Arsenal can’t say they weren’t warned. The second goal wasn’t dissimilar, in that originated from the left-back zone, where Baines was taking a throw-in. This time Naismith and Mirallas combined between the lines, before switching the play out wide quickly to Lukaku, who cut inside, beat Monreal and Vermaelen easily before finishing with his left foot. The third? Well, this time Baines wasn’t involved – but Sagna was tackled in the opposition half by Mirallas, who broke quickly. It was more 4 v 4 than 3 v 3, with Barkley and Mikel Arteta involved. Again, Mertesacker had been pulled out towards the touchline to cover the space left by Sagna, and it’s into the space between he and Vermaelen that Mirallas played the crucial ball to Naismith – Szczesny half-saved, and a combination of Mirallas and Arteta’s desperate tackle sent the rebound into the goal. 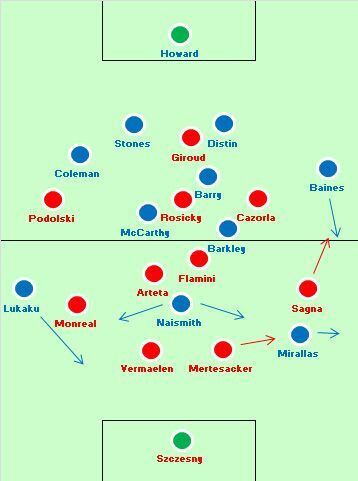 There were key three factors: Sagna always being brought out of the defence, because of the lack of protection from ahead, Mirallas and Naismith making clever runs to bring the centre-backs out of position, and Lukaku storming past Monreal repeatedly. It’s also worth outlining Everton’s discipline without the ball. Naismith dropped off, often alongside Barkley to become a fourth central midfielder, with Mirallas and (to a lesser extent) Lukaku shuttling back to defend the wide zones – look at Mirallas’ recoveries below. Everton were a genuine 4-6-0 for long periods without the ball. They pressed heavily when Arsenal played the ball into the midfield zone, and made some particularly strong tackles in the first half. Arsenal seemed unwilling to bypass this press, too – long balls were rarely hit towards Olivier Giroud, and there was little threat of pace in behind, to bypass Everton’s 10 outfielders in one go. 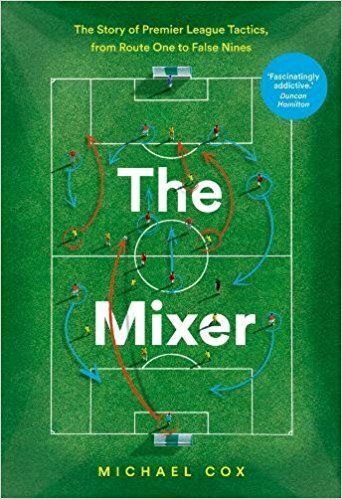 Martinez’s approach was a genuine surprise and it demonstrated his ability to make clever tactical decisions – he preaches possession football, but he doesn’t leave it at that. He stresses the importance of a positive overall approach, but is capable of varying small factors to suit the specific challenge of the opponent. Naismith’s intelligent role was crucial in making Arsenal’s back four uncomfortable, although it might have been Lukaku’s positioning which Martinez thought about first – Arsenal’s left half of the defence was weakened, after all. For Arsenal, it’s another away defeat against a big side. Again, they struggled against an aggressive midfield press and direct attacking based around intelligent movement, and now fourth place is very much up for grabs. One thing regarding Lukaku positioning – there was a precedence in playing big centre forward out wide in Everton – Arsenal match and it was also one sided game then. During 1st matchday of 2009/2010 season Everton lost at Goodison Park to Arsenal 1:6 and one of the problems for The Toffees during that game was caused by Wenger’s decision of playing Nicklas Bendtner at right wing. He was aften used as a target for long kicks from Almunia and cause plenty of problems to much smaller Baines. I’ve noticed something similar with Chelsea, only instead of a wide striker, they push Ivanovic right up the pitch into the same position to win headers against fullbacks which are, traditionally, weaker in the air. 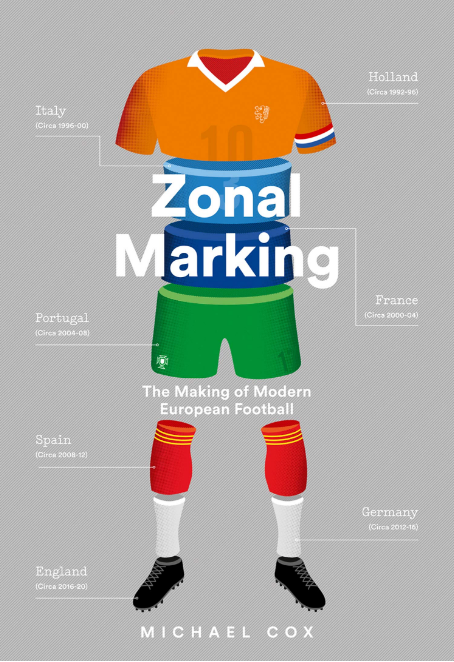 It is an overall trend for many Premier League sides. See Luke Shaw at Southampton pushing higher to win angled goals kicks to attempt to avoid the centrebacks. Even Sagna in the game was used for a similar purpose. Back in a few years ago Moyes used Anichebe as a “winger”, and while this works in theory his lack of work rate and pace just let him down. It is now becoming trendy to utilize a “battering ram” player on the wrong side of his better foot to cause problems physically for the full back. Basically a evolution of the Flo pass tactic. How much was the possession percentage for both teams? 57:43 for Arsenal according to BBC. After 1st half guests had over 60% for sure, somewhere I saw even 69% at HT. I didn’t see Lukaku’s not tracking back as ‘defensive weakness’ – looked to me like he was told to stay up. Although Naismith was central, he tended to drop deeper than Lukaku, which meant that Lukaku still offered the outlet of a long ball if needed. with Naismith vacating the #9 position, Mirallas and Lukaku cutting in caused all kinds of problem for Arsenal’s center backs. On Everton’s right, Arteta was not athletic enough to help contain Lukaku. Surely the way to counter Naismith’s movement was to have Flamini track him, and have Arteta and Rosicky mark McCarthy and Barkley respectively? That would leave Barry free, but he’s not the most incisive passer in any case. Don’t see how Arteta and Rosicky can cope with the physicality of McCarthy and Barkley, and tbf Barry did start enough attacks from the back to be treated seriously – at least pressure should be maintained to keep him far enough from goal. In addition that means Mertesacker and Vermaelen don’t have anyone to mark, and the gigantic hole between Mertesacker and Sagna will be still there for Mirallas to dart into. Fair enough points, although I really did expect Vermaelen to be able to cope with Naismith at least 1v1. I guess that Arsenal’s longstanding weakness of power and physicality in central midfield is still creating a lot of problems for them. Another point: the likes of Podolski and Cazorla aren’t doing enough offensively to forego their defensive duties – the lack of defensive discipline amongst Arsenal’s front 4 has been astonishing and made very apparent in these heavy defeats against top opposition. Compare this to Liverpool’s attacking players. Yes; I’ll put the blame mainly on Carzola’s inability to maintain a shield in front of Sagna. For starters moving Rosicky out to simply act as a shutter will do wonders. Sagna can at least do a job on Mirallas, and while Monreal will still be hapless against Lukaku, the latter will not get as much support as of the match. so mike in essence Everton played a 4-3-3/4-3-1-2 hybrid? I would call it a modern diamond 442 with the 2 pushed really wide. It reminds me more of Man City with only one striker when Aguero is out. I think 460 is more accurate as well. I think they great managers are now really able to adapt their systems to exploit opponent weaknesses. Wengers big mistake was playing with Rosicky and Cazorla. They are way too slow to threaten Baines and way too small to handle Barry, Barkley, and McCarthy in the middle. If Ox had started, Baines would have been more cautious and the entire Everton left flank would have had to play more conservatively. There would have also been less midfield congestion. Not to mention AW again not making ANY changes until the 66th minute despite the fact that by the 15th minute it was obvious there were issues. All in all very poor from Wenger. It was ludicrous for wenger to bring on chamberlain and Ramsey after the third goal. Surely when you go two down the prevailing wisdom would be to bring on attacking reinforcements then. AW has been tactically awful and what’s more these are basic tactical adjustments he is failing to adapt to. Like Jose Mourinho said regarding guardiola’s ‘redundant possession’ arsenal may bank 60 percent of the ball but what’s the point if there’s no incisiveness in the final third nor any movement from wide players? It was an atrocity at Goodson park and aw has a lot of thinking to do because after 1000 odd games perhaps the game has passed him by. The main difference is that Distin for his age is still one of the league’s faster central defenders, and can afford to push Baines up.